Vortex Joe, N3IBX Collection AUCTION! Discussion in 'Amateur Radio News' started by AA7BQ, Oct 30, 2018. We were recently contacted by an auction company, AARauctions.com, about a large collection of amateur gear for sale by online auction. They had asked if they could advertise in our online swapmeet however due to the nature of the sale, we thought it best to mention it as a front page article. This is a HUGE auction with over 400 items. Mostly older gear, lots of Military and Industrial, along with plenty of ham gear. Please note: QRZ is not affiliated in any way with AARauctions.com, and has received no compensation whatsoever for this article. The information regarding this auction is provided as a public service to the community. QRZ has no information other that what is printed in this article regarding this sale. More about Joe N3IBX can be found at the Vortex Joe Museum. KD2ANN, KC2YMO, KC2DHU and 5 others like this. I know Joe....or at least, I did. 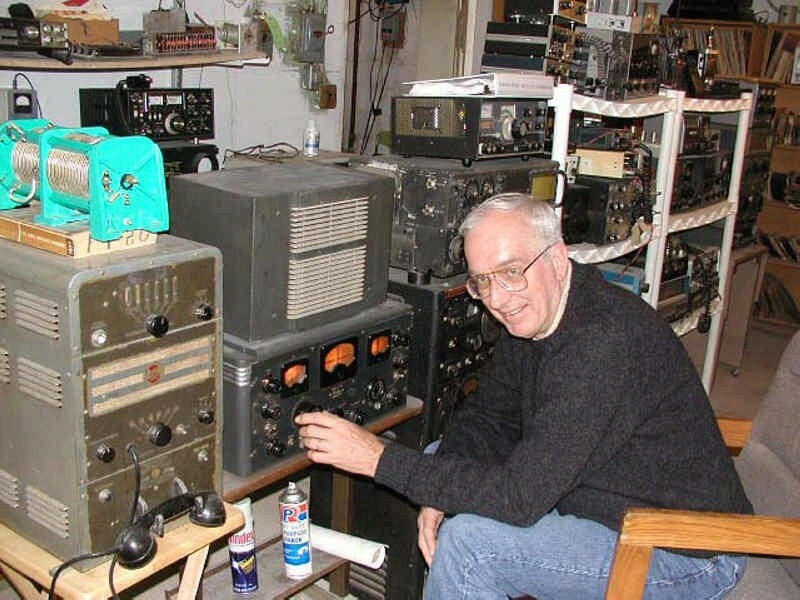 Way back about 20 years ago I sold him a DX-100 that needed lots of work, a homebrew receiver built by W3QLV (SK) and an 80 meter frequency synthesizer (also by W3QLV - it was in QST). Glad to see he's still doing his thing. Thanks for putting this front-and-center! I'm pretty sure that the Valiant II is the one that he bought from the guy I sold it to. I bought it from the Murray Hill Bell Labs club station back around 1980. Just looked again at the pics... if that's mine it has sure taken a beating in the 15 or so years since I've sold it. Was near mint when I sold it! And the link at the bottom to W2DTC page... Ken was my very first 'real' QSO on 80 meters back around 1969-1970! W7UUU and KA2RRK like this. Oh my, that just way too many radios especially when you have to build a 2nd and 3rd building to hold your radio collection. I was going to say that this guy really needs to get a Hobby but then I realized that this is his hobby. NH7RO and N2EY like this. "Hoarding" >>> the "Hobby of Owning"
WN2C, NH7RO and K7MH like this. - All the radios are stored safely. They're on shelves, in racks, etc. There are pathways to get to everything. - Joe is thinning the collection. Others will get to enjoy the radios. VA7ZZT, NH7RO, KA2FIR and 2 others like this. "This is a huge online auction of over 350 items from Vortex Joe's (N3IXB) 50+ year collection." Correction on Joe's call it is N3IBX . Have know Joe since around the early 90s. K4TJA, NH7RO and N2EY like this. NH7RO, N2EY and W7UUU like this. I see at least a hundred new QRZ Trivia questions beginning with "What is a ...?" K7LZR, NH7RO, SA6CKE and 2 others like this.